Are you Gym Hot or Gym Hot Mess? Baggy sweat pants, torn t-shirts and drab colors can take some of the zing out of your workout zeal. When you head to the gym dressed like that you look more ready to tackle a dirty chore than embrace healthy habit. Maybe you feel that way, too. Change your attitude and, while you’re at it, change your style. Working out can be fun and you can look good while doing it. Ready to step up your gym style? Look for workout gear that combines function and fashion. Tops and bottoms made of special technical materials mean no more sweat stains. The fabric wicks away moisture to help you stay cool while you work up a sweat. There are also a number of nifty products such as hoodies with headphones built into the drawstring (no more fighting with cords), pants that offer tummy support and socks that keep your feet cool and blister free. It isn’t true that you have to be a certain size or body type to be gym hot. When it comes to being hot, confidence – not size – is what counts. So go ahead and ditch the sack like clothes! You can wear cute workout gear now. Grab a trusted friend for feedback and try on some of the new spring styles. Maybe you won’t choose biker shorts and a sports bra, but that doesn’t mean you can’t go for a strappy tank top or cute capris. If you aren’t ready to change your style, definitely consider adding some color. Bring the shades of spring into your gym hot style. Who knows? When you go from blah black workout pants to colorful prints you may just find that you have a little extra pep in your exercise step. Just say no to yesterday’s styles and yesterday’s funk. 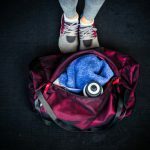 Take care to avoid the dreaded “permafunk” that often marks gear you have drenched in sweat. Look for heavy duty or sports detergents that are tough on odors (you can even add baking soda to the wash). 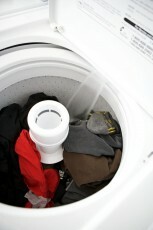 Also, whenever possible, air dry your workout gear to avoid baking in any odors the washer leaves behind. It is possible to be chic even while you work up a sweat. Get fit and be fashionable while doing it. Bright colors, pretty prints and sizzling styles await every body type and budget. 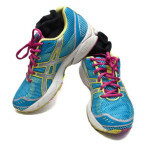 You will feel especially gym hot when you tie your workout purchases to fitness goals – double reward. Check out catalogs from places like Athleta and Lululemon or stores like Target, Nike and Wal-Mart for a range of styles and price points.